Canon Fax B100 printers produce stunning document and image prints. As a matter of course your Canon Fax B100 will consume all of your printer ink, and when that happens you'll soon find that new Canon Fax B100 ink is generally a costly affair. Fortunately you do not need to waste your time worrying about coughing up the high asking prices you'll uncover on the high street because here at Cartridge Save you can buy all the Canon Fax B100 cartridges you'll need at super low prices. Save a lot of money on your ink by shopping at Cartridge Save! There's no point in spending so much on the Fax-B100 original cartridge or Fax B100 compatible ink on the main street when you can quickly save a load of money shopping online with Cartridge Save. You enjoy complete confidence when you order your Fax B100 ink cartridges from us as each one is underwritten by a straight forward money back guarantee. Bear in mind the fact that each and every purchase comes with free delivery, most likely arriving with you on the following day! The Canon Fax B100 inkjet printer is designed for small offices that need a cost-effective but efficient solution for their business correspondence. The Fax-B100 utilises black-and-white inkjet printing method and it can accommodate a handset, but it is outdated and has now been discontinued by Canon. The compact frame allows the Canon Fax B100 fax machine to fit into cramped and limited spaces easily. A small mono LCD display is at the centre of the control panel and features one-touch operational buttons at the bottom. The Canon Fax B100 ink cartridge is known as Canon BX-3 and is designed to print up to 1,500 pages in black and white. There is ample fax memory for storing up to 50 pages, so if ink or paper runs out, users can still retrieve their messages from the Canon B100 fax. The device is surprisingly affordable to run because of the ink saver mode along with low-cost compatible Canon B100 inkjet cartridges which are available for the machine. 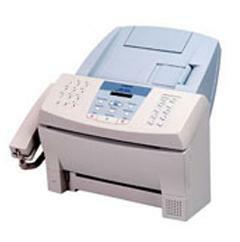 The Canon Fax B100 is full featured with delayed transmission and 50 coded speed dials. Sequential broadcasting is also possible with the Canon Fax B100. Canon discontinued the Fax B100 so it could be difficult to find technical support for it. The control panel can be intimidating because of the busy cluster of buttons. Message transmissions could take longer than newer machines because the Canon Fax B100 uses a 14.4Kbps modem. There are only nine one-touch dials on the Canon Fax B-100.